Do Established Businesses Pay Higher Wages? According to the U.S. Small Business Administration, about half of new businesses survive more than five years. By 10 years that number drops to a third. The age of a firm can say a lot about its overall success in its industry. However, it is debated as to whether the more established firms pay employees more than new companies do. The majority of Idaho’s employment is with older firms. Almost three quarters of Idaho’s stable jobs – those that last at least a full quarter – are in firms that have been in business 11 years or longer. The next oldest group, those that have been operating for six to 10 years, follow with 13 percent of the total employment. 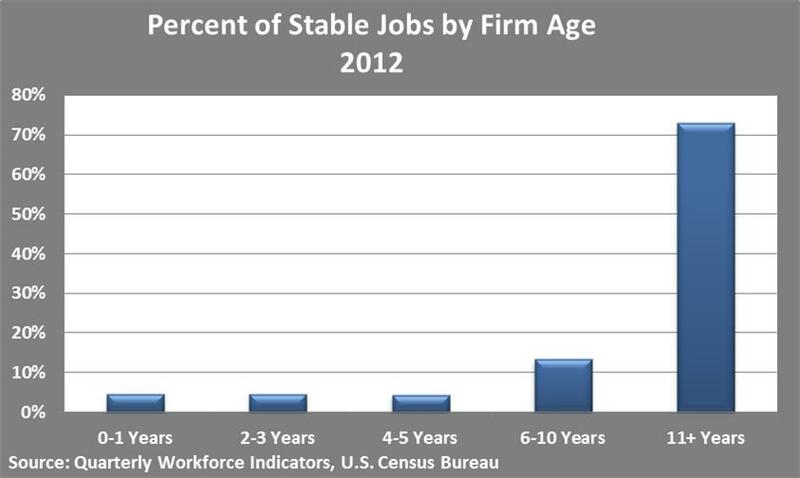 The younger firms employ around 4 percent each, so combined they come in just under 13 percent. Average monthly earnings of employees in 2011 also favored the established firms. With over $3,200 per month, the only group to come in above the all-firm average of $3,100 was the group with companies 11 years or older. The newest companies had the lowest average monthly earnings with $2,116 – 55 percent less than the oldest firms. Companies in the 2- to 3-year group came in slightly ahead of companies in the 4- to 5-year range. 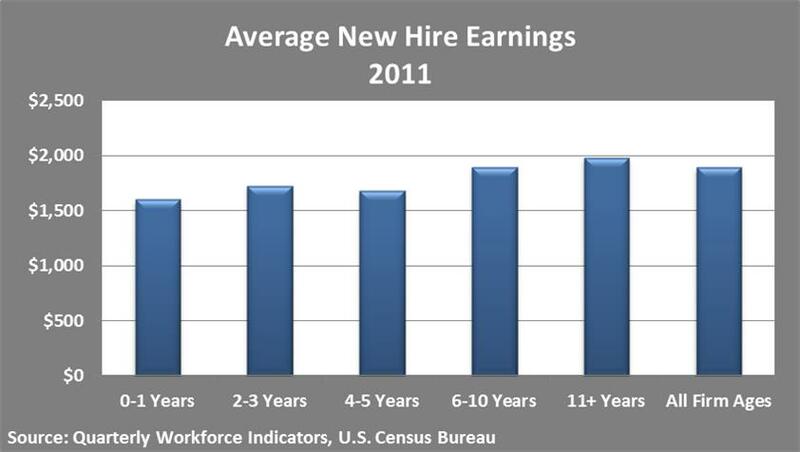 The earnings ranges are much closer when looking at data for new hires. The oldest firms still pay the most with an average new hire worker earning $1,982 per month, but the difference between the oldest and the newest firms is 24 percent or almost $400. Also firms in the 6- to 10-year-old range pay above the all firm average, if just slightly. There are several factors other than the age of the firm that can have an effect on the earning level of employees. Unfortunately, only a few of these factors are captured by the Census Bureau. One factor that tends to be strongly correlated with wage level is education. The graph below compares average monthly earnings by the level of workers’ education and firm age. At the lower levels of education, there is little difference in the average level of earnings among the firm ages. The lowest paid are found in the newest firms, averaging over $1,900 per month. This is 26 percent less than the highest paid in the oldest firms. As the level of education increases though, the earnings disparity increases. Those with bachelor’s degrees or higher earned an average of $5,400 per month while the lowest paid, again in the newest firms, earned over $2,000 less. This was lower than the average earnings paid by the oldest firms to workers with either some college or an associate degree. In each education category, the age of the firm was positively correlated to the wages being paid except for the firms in the 2- to 3-year-old group, which continued to have a higher average earning then those in the 4- to 5-year-old group. New hire wages followed the same pattern with employees who had bachelor’s degrees and higher making noticeably more than the other categories, but also having a notably higher spread among the firm ages. There is almost a 40 percent difference between the youngest and oldest firms in the wage paid to new hires with bachelor’s degrees or higher. Industry can also play a large part in determining the average earnings level and some industries do break the pattern. Firms that were not the oldest paid highest average wages in health care and social assistance, information, management of companies industries. The picture for new hires is much more scattered. While in many industries the oldest firms pay more in earnings, 11 don’t. Five of those land in the 4- to 5-year-old group. While there are a lot of caveats, it does appear that the more established firms in Idaho are paying higher wages than the newer firms. This is especially true for workers with more education. However, there are many other factors that aren’t captured here, such as levels of experience and occupations being filled. Also looking at the data for hires by industry, and especially new hires, shows there is some argument that the earnings landscape isn’t as dominated by the older firms as it would seem. This article originally appeared in the October issue of the Idaho Department of Labor’s monthly economic and employment newsletter. Interested in reading more articles like this? Please send an email to Donna.Corn@labor.idaho.gov to subscribe to the newsletter. This entry was posted in Employers, Employment News and tagged idaho department of labor, idaho jobs, small business administration, wages on November 6, 2013 by Idaho Department of Labor.